I can hardly believe it’s been almost 10 years since A Primitve Glow began and nearly 20 years since I started making candles! Many of you already know my story. 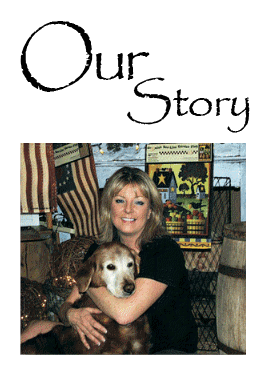 The idea of creating candles with scents that would take us back to simpler times came to me one cold and snowy January day, while driving home from Canann Valley, West Virginia with my golden retriever named Rusty (Rusty has passed but his buddy, Brandy helps out at the shop every day). I wanted to evoke memories of those days spent with my grandma making blueberry cobbler, picking apples for hot baked apple pies or making a pan of homemade cinnamon buns. Many childhood memories kept rushing in- like the days just before Christmas, baking cookies for Santa, stringing cranberries and decorating with fresh pine. I also knew I wanted a look that was country, homespun and heartfelt. Every candle is hand poured, hand dipped, accented and wrapped at our shop located in the beautiful mountains of West Virginia. My mother and grandmother have been great inspirations in my life and they are the reason that I am where I am and who I am today. I will forever cherish the times we share and the many wonderful things I’ve learned from them.